Well, friends! 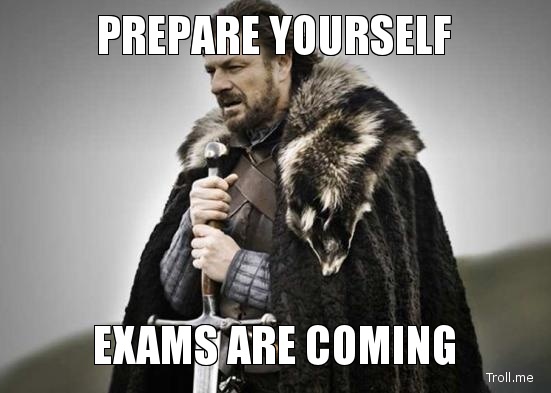 It’s the day most students both anticipate and dread. The day they look forward to with both excitement and anxiety. Today kicks off finals week, three days of final exams, projects, presentations, and papers that stand between you and freedom. Three days that stand between you and graduation. Three days that stand between you and summer break. Just thinking about summer vacation brings a single tear of joy to my eye. So what can you do to perform at your optimum level and excel in your classes? Take a look back at my post before winter break, Rock Yo’ Finals! Remember, the best way to prepare for what can be a pretty stressful week is to approach it with a peaceful mind, calm spirit, and confident demeanor. You can do this! I believe in you, so believe in yourself. Need relaxation tips? Check out this awesome Buzzfeed video that provides some calming tricks. can you please tell me the exact date sheet of exams ?